Weekly Famitsu hit the magazine racks today, and if you picked it up eagerly looking for more information about Final Fantasy Versus XIII in the interview with Nomura Tetsuya (more than just the leaked tidbits of info), well you were probably let down... But if you picked it up looking for information on Kingdom Hearts 3D: Dream Drop Distance, you were well rewarded. In the first half of a two-part interview (part 2 will be in next week's Famitsu), Nomura talked about the overall theme of the game: A sort of yin-yan juxtaposition between the protagonists, Sora and Riku. "Some people looking at the package design may notice the ‘Darkness becomes light, as light falls into darkness' catch copy we're using." Nomura said. 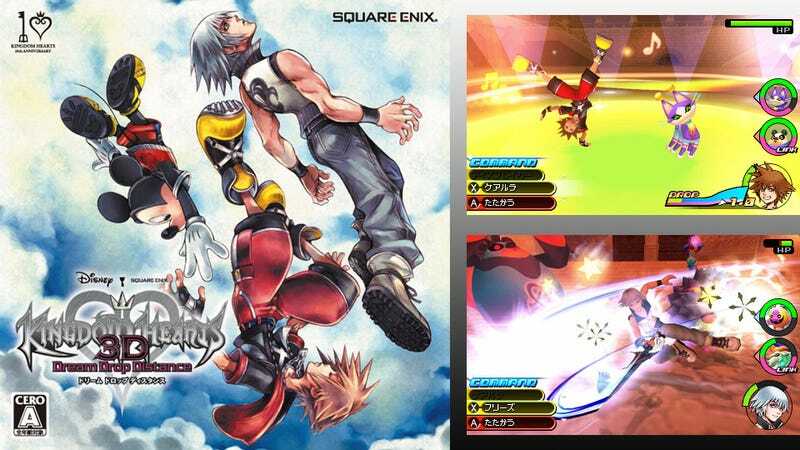 Nomura added that there was hidden meaning to the fact that Riku's eyes are open while Sora's are closed in the picture, but "people will have to find out in the game." One of the core elements to the game's system involving the capture and training of Pokemon-esque creatures called Dream Eaters. Nomura expressed enthusiasm for the system, stating it was something they had wanted to revisit from Kingdom Hearts: Birth by Sleep. "I wanted to overhaul the Command Board system from Birth by Sleep. By mixing that with the progress system from Re:Coded and 358/2 Days, we came up with the new Link System." As to why Donald and Goofy won't be the player's partners this time around, Nomura pointed out that since the two of them aren't Keyblade wielders, it wouldn't fit the story of this game. He added, "Those two are for the numbered titles." Dear Mr. Nomura: Please make another numbered title (and hurry up with Versus XIII).